With hot weather sweeping through the world, WonderFox, the leading multimedia solution provider, decides to make its flagship software - WonderFox DVD Video Converter International Edition Free for all network users to cool off 2015 summer, which will benefit online users greatly. 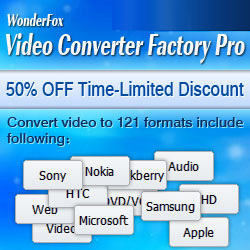 Any web users are free to approach WonderFox DVD Video Converter Giveaway from July 13th, 2015 to July 24th, 2015. Have you ever experienced this? Summer area heating is unendurable and sun keeps burning, which makes watching movie in theater a worse idea: You are totally not in a mood for lining up outside for a single movie ticket. However, watching movie is an ideal thought to kill time in the tedious summer and watching silver screen movie is still attractive and unstoppable. This dilemma eats you badly and upsets you: All you want for the moment is to realize the movie watching and avoid the blazing sun. Have you ever dreamed this? In your sweet air-conditioning living room, a plate of popcorn is placed on tea table right before TV. With several cups of ice-cool coffee, some glasses of ice beer and a few bottles of tasty beverage, you and your beloved families sit in cozy sofa, laughing and watching your favorite movie or drama altogether, throwing away outdoor scorching weather and the queuing thing completely, enjoying the cherished moments to the fullest. Or, you can have fun on the beach with your families: sea water is washing the beach sands, you and your families are enjoying the comfortable time on beach chairs, listening wind sizzling, watching videos on your pride device at ease under umbrella. WonderFox has provided online users with a wonderful cooling tip this summer - Back up your keen movie DVD to your TV, PC or any other mobile devices with WonderFox July Gift – WonderFox DVD Video Converter Giveaway. With the help of this gift, you can watch your beloved movies anywhere anytime with anybody. Installed this powerful video converter on PC, you can deal with almost any devices and formats incompatible issues fast and easily, making videos play at your will. * International Edition- Have English, Germany & Spanish Edition Embedded, and many more language support will come later. It’s the most friendly software ever. With mere three steps, you can master it. Secondly, install the software and register the software with WonderFox DVD Video Converter giveaway license. Thirdly, launch the software, select whatever graphic button on the interface, you will get what you want in the end easily. Just enjoy your sweet summer vacation by start watching movie now! And leave alone over-heating summer with 2015 WonderFox Summer Giveaway Gift. WonderFox Software is a multimedia software developing group, specializing in making practical and easy-to-use software all over the world. As a leading video converter provider, WonderFox is dedicated in providing users one stop multimedia solution, from PC to home theatre, from PC to mobile devices, all built in one software. Due to its high-end quality and seamless service, WonderFox have about 3,000,000 loyal customers all over the world. WonderFox’s aim is to produce the most satisfactory software and provide the best service for software users.